The State government has made it clear that there will not be any extension of the deadline for shifting of secretariat employees from Hyderabad to Amaravati. Chief Minister N. Chandrababu Naidu said they have made plans keeping the academic year in mind and any deviation from the plans means a considerable delay which, he said, he is not ready for Stating that shifting of the secretariat from Hyderabad to Amaravati had already been much delayed, he does not want to prolong it further. “I repent that I have not come much earlier here. I should have come here earlier and should have worked from a tent under a tree. But, it is better late than never and if we start now it will take sometime for settling in." Though Hyderabad is a common capital for 10 years, he said it is not proper to cite it as a reason to delay shifting as the administration of the state has to be done from the state itself. “It is already two years and if we delay further, people will lose faith in us,” he said “Do you think I am not making any sacrifices? You may have relievers in your job, but I do not have any. My wife visits me only once in a week and I am yearning to see my grandson, but I do not have time. Even if I work round the clock, putting the state back on the path of development is herculean task," he said. Stating that it will take three to four years for the buildings of secretariat to get constructed, he said that till such time they will be using the temporary secretariat and afterwards those buildings will be used for other purposes. Naidu tells officials to see that the secretariat employees are shifted to the new capital June27. 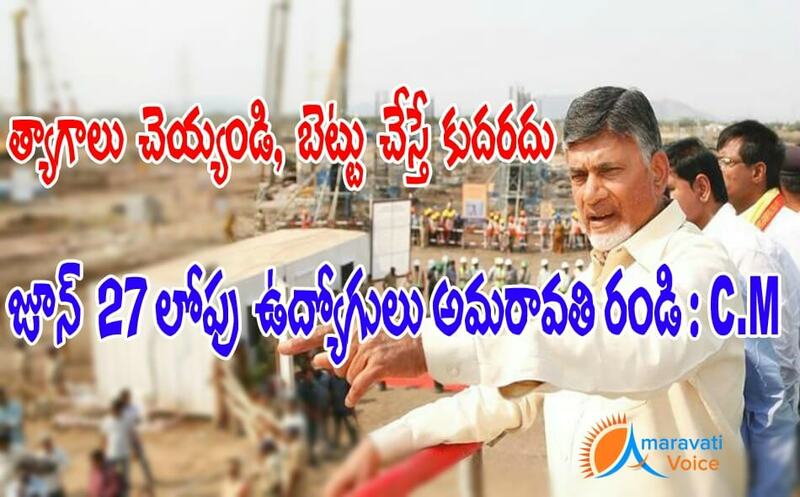 He also wanted the HoDs to shift to Amaravati as planned. It was decided to shift CMO, ministers offices and offices of principal secretaries of different departments first to the AP transitional headquarters and accommodate other departments gradually. Meanwhile, the shifted departments in the secretariat will be accommodated in rented spaces in Vijayawada and Guntur.